Eight categories were used to measure overall cost benefits of homeownership: property taxes, affordability, property insurance costs, foreclosure rates, maintenance costs, average monthly home energy costs, appreciation rate and rent hedging. Portland-Vancouver-Hillsboro ranked in the no. 1 spot with a cumulative score of 60.58 out of 80, earning a perfect 10 for property insurance. Hartford-West Hartford-East Hartford, Connecticut, ranked no. 50 with a score of 33.62, and the area got a zero for energy and appreciation. Costs like utilities, property taxes, foreclosure rates and a slew of other factors can make or break a real estate decision, so Bankrate.com released a list ranking the best metro areas for homeowners throughout the nation. Determining the best and worst areas for homeowners is a little tricky, Bankrate says, because quality can vary block-by-block in metros. “Major cities in the middle of the country did really well in this ranking,” Bankrate analyst Claes Bell said in a statement. Susan Wachter, a professor of finance and real estate at the University of Pennsylvania’s Wharton School of Business, was sought by Bankrate to work on the report; data was pulled from Attom Data Solutions, HomeAdvisor.com, the National Association of Realtors, the Federal Housing Finance Agency Data, the Council for Community and Economic Research and the National Association of Insurance Commissioners. After compiling the data, Bankrate measured affordability, maintenance, property insurance, property tax and more using a score from 0 to 10 for each category, combining for a total of 80 points. 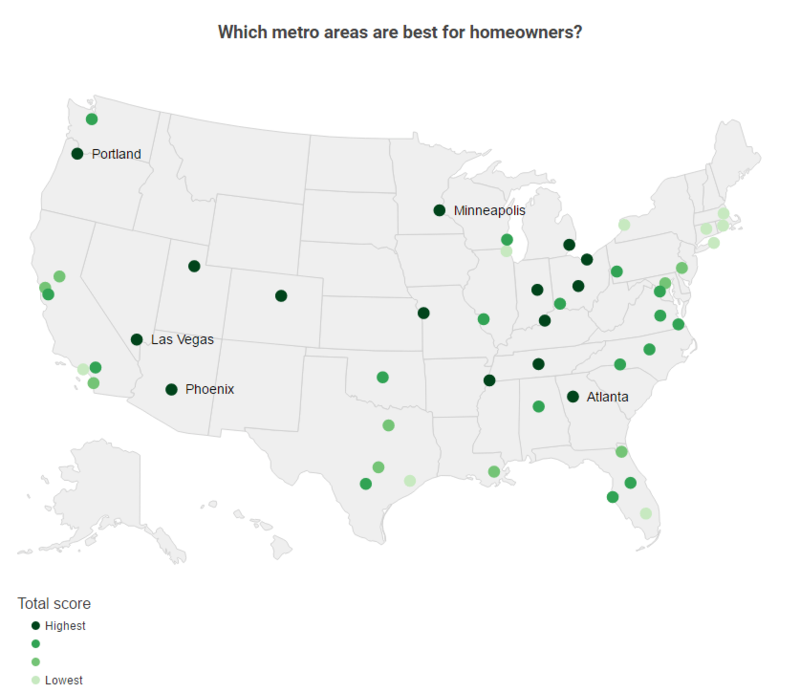 The top-ranking metro for homeowners was Portland-Vancouver-Hillsboro, Oregon-Washington, with a total score of 60.58. While the area ranks high for property insurance (10/10), rent hedging, which is the pace of rent increases, and affordability rank low, at 3.25 and 5.97, respectively. At the other end of the list, Hartford-West Hartford-East Hartford, Connecticut, ranked no. 50, with a score of 33.62. The area got a zero for energy and appreciation. Ranking no. 35 on the list, San Francisco-Oakland-Hayward got a zero for affordability. The metro got a total score of 44.45, gaining its highest score (8.47) in the energy category. Property insurance got a score of 7.43 and foreclosure scored 7.82. Categories that ranked low were scores of 4.87 for property tax and 4.43 for rent hedging. Los Angeles-Long Beach-Anaheim was much further down the list, ranking no. 47. The Southern California metro got a total score of 39.09. The lowest reported categories were rent hedging and affordability, which had respective scores of 0.98 and 1.91. New York-Newark-Jersey City, NY-NJ-PA, ranked even further down on the list, at no. 49. The nation’s largest metropolitan area got a perfect score of 10 for rent hedging, but it was hurt by a zero score for property taxes. In total, the New York metro got a score of 36.74 out of 80. Other major metros like San Diego, Miami, Boston, Houston and Chicago ranked in the bottom five metros reported by Bankrate. The Miami-Fort Lauderdale-West Palm Beach earned a zero score for property insurance and a 1.28 for foreclosure. In total, the metro received a score of 41.02, which was pulled largely by a score of 9.18 for home appreciation. Chicago-Naperville-Elgin, IL-IN-WI, ranked in the no. 44 spot. The metro got a total score of 40.84. For the eight categories, foreclosure got a zero and rent hedging got a 1.54. The highest score was received in the affordability category, with an 8.51. Ranking just below Chicago, Houston-The Woodlands-Sugar Land metro got a total score of 40.38. The metro got a zero for foreclosure and a 1.80 for property insurance. The highest scores were reported in affordability, at 8.05, and foreclosure, with 7.93.